MAK & Associates take pride in being one of the longest established legal practices in Dubai. Since 1983, our diverse experience has given us profound knowledge of the local laws and procedures. Our credibility and well-established name in the market has been built over many years of practice. Our client base speaks on our behalf, ranging from multinational corporations to private individuals, all of whom benefit from our professional and legal high standards. MAK & Associates believes that ‘actions speak louder than words’, and regardless of the client, only the outcome matters. Our client’s expectations are managed with the highest standards, at the most optimized costs, and in the shortest time possible. After leaving his home country of Syria, Mr. Maamoun Al Khouli relocated to Dubai, UAE where he planned to start his own practice. An office was established and the legal journey started by specializing in corporate and commercial affairs as a strong advocate focused on litigation in UAE local courts. After 15 years of legal work in the UAE, Mr. Maamoun decided to open a new partnership, branding it Maamoun Al Khouli & Associates. The firm grew to become a multi-disciplinary practice, catering to International law firms, financial institutions, maritime and insurance providers. As a key player in the legal sector, Maamoun Al Khouli & Associates attributed to many wins in the respective markets, offering highly focused and strategic niche market services. Completing his LLM from Dickinson’s Law in the USA, Mohamad Al Khouli joined the firm as a Legal Counsel. Seeing the local market and it’s huge potential for success, he began to expand the legal team and the various service offerings. Slow over time, Mohamad grew the firm to offer a full spectrum of legal services within the civil, commercial and criminal sectors, with a specialization in litigation. After graduating with her LLM from Dickinson’s Law in the USA, Lama Al Khouli joined the family business and started her legal career. Wanting to follow in her father’s legacy, she worked alongside Mr. Maamoun and Mohamad, constantly learning and growing from his years of legal experience. More than three decades later, Maamoun Al Khouli & Associates celebrated their 35 th Anniversary. Looking back on the years of accomplishments, legal partnerships and clients relationships formed, the firm continues to keep to its core values of trust, integrity, honesty, respect and encouragement, which were instilled by our founder. 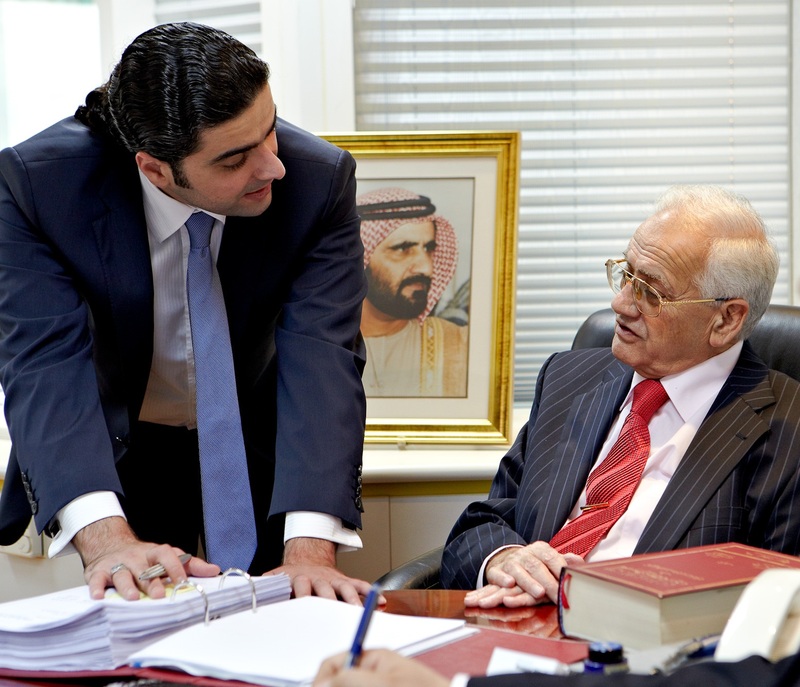 With over 50 years of legal expertise, Mr. Maamoun Al Khouli continues to practice law as an advocate before the Courts, remaining true to his commitment to the practice. We have been working with MAK & Associates for over four years and are very pleased that we have built a lasting business relationship built on trust and communication. MAK handle legal cases professionally and with due care have produced a number of positive results for us. MAK & Associates has always been a part of our business. As we grew, our business grew and got protected, the legal services provided are satisfactory in terms of the results, special thanks to Mahelet Asefa’s great ideas with commitment. I have been working with MAK & Associates for the past year and they constantly provide high-quality legal work and deliver within our deadlines. I highly recommend working with MAK & Associates. They protected our business’ best interests while making our legal rights easy to understand and apply. Since March 2017, we have been working with MAK & Associates for all our corporate compliance needs and we feel confident that our business will be handled professionally, swiftly and thoroughly. MAK & Associates Legal Services team provides quality, reliable and transparent advice to Bin Sougat Group. The team believes in doing the right thing and acts in the best interest of the Group. No matter the situation, we find the services of MAK & Associates to be timely, efficient and cost-effective. Well done MAK & Associates, many congratulations and wish you all success. MAK & Associates and Brightstrar FZE are partners for last 5 years. During this time MAK & Associates provided exceptional service of Legal and PRO support. Very pleased with constancy of their Employees, for entire period we have same Legal Advisor which makes possible to keep history of the Company. At any point of time all our queries were answered professionally and promptly. It’s a big pleasure to deal with MAK & Associates and we`ll definitely continue partnership. MAK & Associates and Brightstrar FZE are partners for last 5 years. During this time MAK & Associates provided exceptional service of Legal and PRO support. Very pleased with constancy of their Employees, for entire period we have same Legal Advisor which makes possible to keep history of the Company. At any point of time all our queries were answered professionally and promptly.